Swordswomen, working boys, crypto-fascist poets, bohemians, Decadents, Surrealists, occultists…business as usual really. 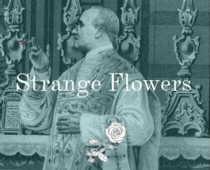 The story of the strange, shadowy aristo-poet – in book form. “I watched the pale evening cast her olive veil/Over the fields and woodlands of the sea…”.